The cover of The Sadies’ new album is a powerful image of the northern lights made by photographer David Kilabuk in Pangnirtung, Nunavut, a sight few of us will ever get to behold with our own eyes. Yet, the awe-inspiring natural beauty and mystery captured in the photo are an ideal reflection of the music contained within. No further embellishment seems necessary. 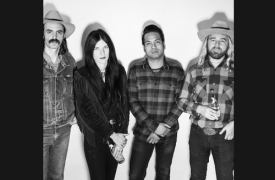 That’s been the essence of The Sadies’ story ever since the quartet comprised of singer/guitarists Dallas and Travis Good, bassist Sean Dean and drummer Mike Belitsky first exploded onto the North American scene 20 years ago. Back then there was still something called “alt-country,” a catchall for artists striving to carry on traditions with punk rock attitude. 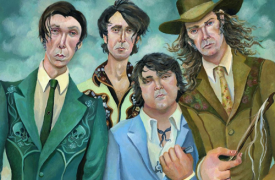 The Sadies certainly fit that description, but the breadth of their skills and musical knowledge was unparalleled since a group of fellow Torontonians left Ronnie Hawkins in the mid-‘60s to take a job backing Bob Dylan.